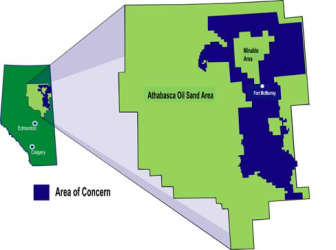 The BlackGold Oil Sands Project is located approximately 10 km southeast of Conklin, Alberta. Acquired from Korea National Oil Corporation (KNOC) in 2010, construction and development of the project began later that year. 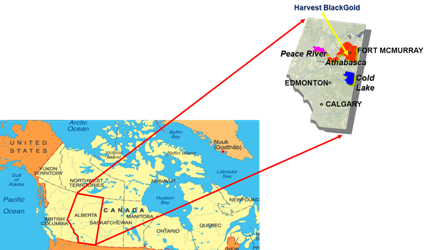 At the end of 2016, Harvest’s BlackGold oilsands property had Proved Undeveloped bitumen reserves of 96.0 MMbbl and Probable Undeveloped bitumen reserves of 163.2 MMbbl and are located in close proximity to a number of major oil sands developments in the Conklin Region of Northeastern Alberta. Phase 1 of the project (the Initial Project) is anticipated to produce 10,000 bpd. Approval for BlackGold’s first phase has already been granted by the Energy Resources Conservation Board (ERCB) and Alberta Environment (AENV). BlackGold’s second phase (the Expansion Project), which was approved in December 2013, is targeted to increase production to 30,000 bpd. 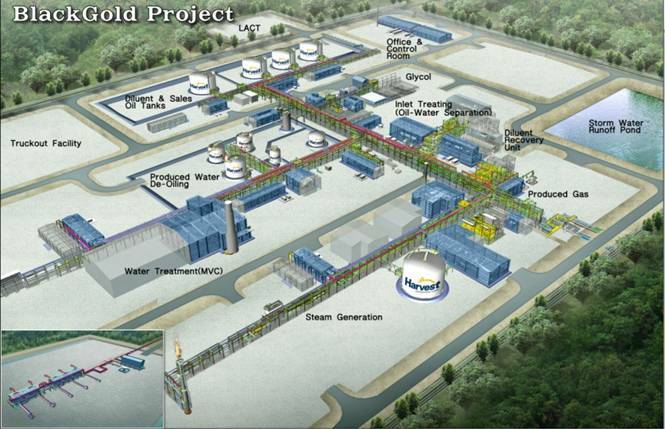 The BlackGold Project is expected to produce over a period of approximately 25 years. BlackGold Reserves will be recovered by using SAGD methodology. 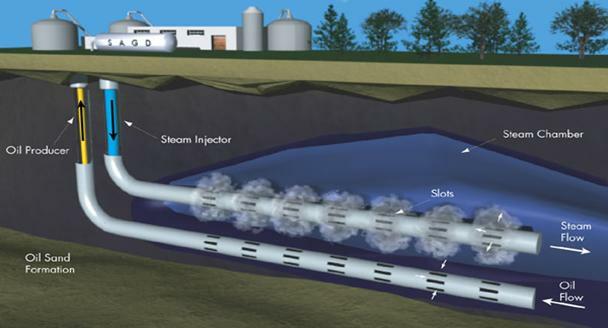 BlackGold will utilize Steam Assisted Gravity Drainage (SAGD), a proven institu production technology that uses horizontal drilling and thermal stimulation to maximize energy and production efficiency and minimize surface land disturbance. 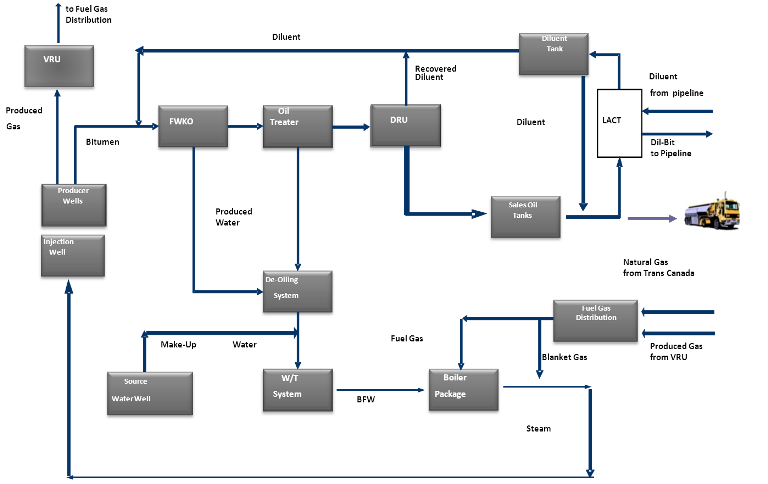 Harvest Operations Corp. maintains 100% working interest and operatorship of the BlackGold project. The project began in March of 2008 with the initial application for approval to construct, operate and reclaim the oil sands to produce at a design capacity of 10,000 barrels per day of bitumen using steam assisted gravity drainage (SAGD) technology. The initial project was approved by regulators in March 2010. 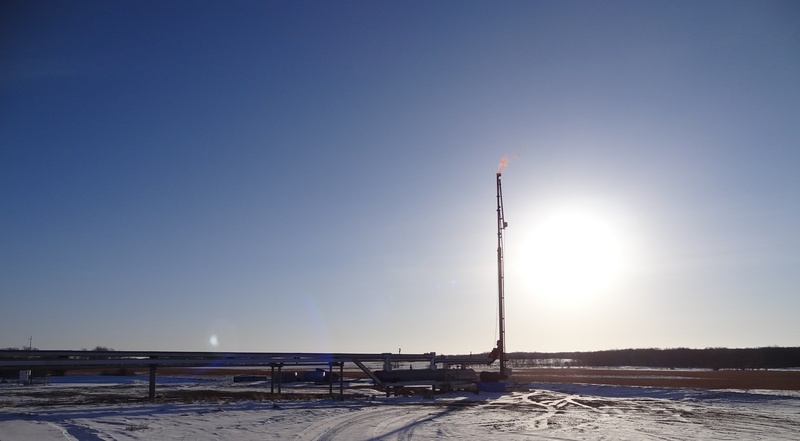 The construction of the production facility is ongoing and the first 15 SAGD well pairs from two well pads were successfully drilled in October 2012. Phase 2 of the project includes plans to expand production to a design capacity 20,000 additional barrels per day of bitumen to make combined production of 30,000 barrels per day. Up to 200 SAGD well pairs from as many as 30 well pads will be drilled to maintain the production capacity of 30,000 barrel per day from the McMurray and Wabiskaw formations over a period of approximately 30 years..
SAGD technology is a well-recognizedand proven commercial insitu thermal recovery process, which we are applying atBlackGold for bitumen extraction from the McMurray and Wabiskaw formations inthe Athabasca oil sands area. SAGD involves drilling of two parallelwells for each well pair. One well in each pair is used as a steaminjection well and is placed ~5m above the bottom wellbore, that is used asBitumen and Produced Water Emulsion Production Well. In the BlackGold project a pair of 650-~850m horizontal wells drilled in parallel within the McMurrayand Wabiskaw resevoirs. These resevoirs are approximately 350-400 metresunderneath the surface. The well pair wells, injector and producer, have avertical separation of approximately 5 metres. The production wells will beplaced approximately 1 metre above the base of the bitumen column. As steam isinjected into the resevoir and the surrounding bitumen reserves are heated up,the bitumen becomes less viscous and flows into the producing well. Down hold pumps then transfer the bitumen to the surface. The pressure chamber can becontrolled by means of steam injection and Emulsion Production rateadjustments. Both Phase 1 and Phase 2 of the project will operate as one facility.